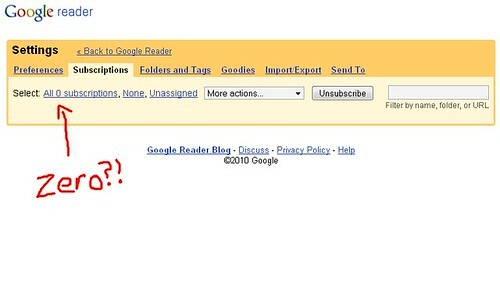 All of my Google Reader subscriptions VANISHED when I tried to check them this morning. All of my tags are still present, but empty. The only thing that appears when I check it… 5 "welcome to reader" type posts. "Apologies for this, a subset of Reader requests for a subset of users were directed to a datacenter that was missing some data. We've now stop sending requests to that datacenter, your subscriptions should be back once you refresh Reader. We love you Mihai Parparita!